In the previous post of this series, I highlighted the importance of the IT-infrastructure. In this post, the focus is on the types of information that can be exchanged and why it is beneficial to share these types of information. Although buyers and suppliers may have contradicting goals (especially seen from a conservative perspective), they have at least one goal in common: making profit. Dependent on contextual characteristics, buyers and suppliers will (try) to interact in a certain way with each other (varying from transactional exchange to close partnerships) to make as much profit as possible. In a pure transactional exchange, both parties will only care about their own profit. In close partnerships on the contrary, organizations try to create as much profit as possible for the buyer-supplier relationship (inter-firm profitability) and divide the additional profit as a result of the alliance in a fair way. The increase in inter-firm profitability can be realized by increasing revenue and/or decreasing costs at the buyer and/or supplier their processes. The exchange of information between the two parties is an important prerequisite in order to increase the inter-firm profitability. Examples of this may be the possibility to align and coordinate processes across organizational boundaries or joint development of new products as a result of sharing information. Dependent on the type of relationship and contextual characteristics (in its broadest sense) the exchange of certain types of information, varying from operational data to strategic knowledge, may result in an increase in inter-firm profitability. 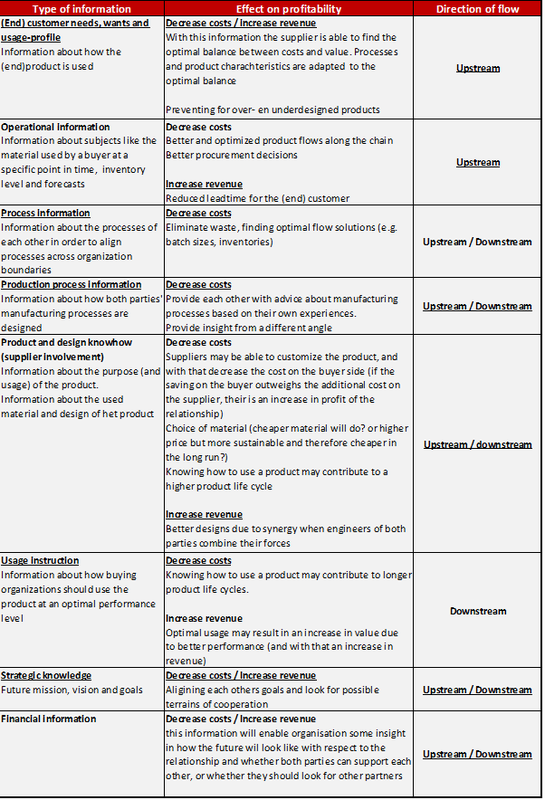 The table below reflects a selection of information types which may affect the inter-firm profitability. The table provides also information about how the exchange of it may affect the inter-firm profitability and the direction of the flow of the information. Note: the table is meant as an impression of the different types of information which can be used for increasing benefits, the goal of the table is not to be exhaustive. While sharing several types of information will obviously contribute to an increase in profit, both parties are often reluctant to disclose information. Although the level of information exchange will definitely be a result of the type of relationship (transactional – cooperative) it surely is not the single factor clarifying the lower level of information exchange than would be expected based on the prospects of increasing profits when increase sharing. Which reasons then are in place why information is not disclosed? In order to find those reasons, we have to understand the process of information exchange by revealing underlying determinants. This will be the subject in the next post of this series.